Your business leaders are counting on you to make a splash with an upcoming event. You’ve hired a top-notch event management agency to ensure that happens. Now, what’s it take to get the most out of the agency you’ve entrusted with this mission-critical assignment? Consider the answers to these six questions and how they can benefit your organization. Why is it important to begin with the end in mind? You and the event management agency are about to begin a journey that involves thousands of decisions, hundreds of moving parts and scores of people. It’s vital to clearly define the project’s goals and objectives and determine the agency’s role. Crucial first steps involve establishing a detailed set of documents, including a statement of work, project budget and timeline. These documents give you and your agency a clear understanding about the desired outcomes and how you will support one another in ensuring the project’s success. Do you want the fast-food order taker or maître d experience? Make a few phone calls and toss out general event specs and just about anyone can make sure the meeting room is set up and there is enough food to eat, sort of like rolling up to the window at your favorite fast-food restaurant and placing your order. 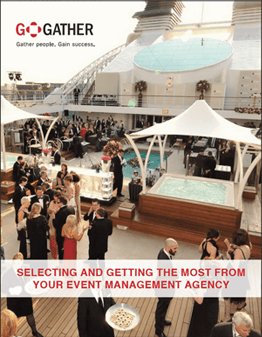 Your event agency should be much more than an order taker, however. To get the most out of them, you should see the agency as an extension of your in-house team. Establish a professional colleague, peer-to-peer relationship. This means sharing the company’s strategies and goals with them, so they know what you want to accomplish. Only then can they expertly recommend a customized menu of corporate event designs that appeal to attendees – and resonate with your leaders. When should you and your event partners get on the dance floor? The sooner the better. Making good plans requires good information. Gather the right people in your organization together with the agency early. Bring everyone in and keep them involved throughout the planning and implementation process. Define your goals and objectives and allow the agency to offer guidance and advice around the format, venue, timing and other details. A good agency should be willing to work with you on conceptualizing the event even before you sign a formal work agreement. The agency will deliver the best work when you engage them actively in your entire decision-making process. Remember, they’re there to put the resources, knowledge and execution skills behind you so you can focus on crucial items like content, stakeholders and attendees. How will the team translate your big-picture goals into actions that put points on the scoreboard? Successful leaders build consensus around goals and objectives. One, or even a few people, cannot do it all. For your event to be a success, you must rely on and lead a large team comprised of a wide variety of managers, contractors and suppliers. For you to excel as the event leader, you need full visibility to the agency’s entire planning process and who’s on the team. Your agency should partner with you to establish a relationship with all suppliers involved, from the hotel to the audio visual company, the transportation company and beyond. With a solid understanding of your business and event objectives, your agency should help you tap into a broad spectrum of independent contractors and suppliers, assembling the best possible team who’ll make your event shine. The agency can also help coordinate the overall event management team, which may include suppliers you already use, so you have a cohesive group supporting you. When all these team members hear your thoughts and feedback, it also creates efficiencies that help them score big wins for your company. Will an online project “roadmap” help you reach your destination on time and budget? Absolutely! A cloud-based enterprise system like Google Apps is a real game changer when it comes to keeping you and the entire event team informed and focused on where you want to go and how to get there. The agency that uses a robust project management system gives you the ability to know where every dollar is being spent and with whom. The system enables you and your team to jump online and quickly see that all the event production work is moving forward as planned, or where pain points may surface that need to be addressed. Just as importantly, the project management system keeps you from being buried in emails and calls. It also ensures that hundreds of document versions are organized and accessible. In short, everyone is connected seamlessly across time zones and locations with all the event details. How do you and the corporate event team keep your heads above water with so much going on? Meetings can be stressful. There are strict budgets and critical deadlines. The list of issues that need to be addressed can seem endless. That’s where the strategic event management agency can really save your life as a meeting planner. They can serve as your overall event consultant, even for those parts of the event they don’t manage directly. Their flexible systems and tools also can give you the big-picture resources you need to operate effectively and efficiently, even when last-minute changes are needed. What makes everything and everyone stay afloat is open communications between partners who trust each other and value the contributions everyone makes to achieve the event goals.